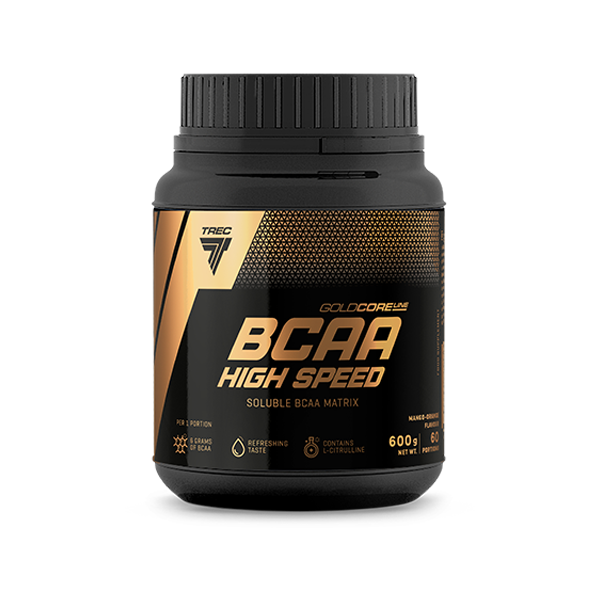 GOLD CORE LINE BCAA HIGH SPEED is the branched-chain amino acid and L-citruline dietary supplement. GOLD CORE LINE BCAA HIGH SPEED contains L-leucine, L-valine and L-isoleucine in a 2:1:1 ratio that is optimal for the body, and beta-alanin and citruline malate. Recommended daily portion is 20 g (4 scoops). Dissolve a single serving of the product – 10 g (2 scoops) in 300 ml of water in a shaker. Take 2 servings daily. On workout days: 1st serving 30 min. before a workout, 2nd serving directly after a workout. On non-workout days: 1st serving in the morning after getting up, 2nd serving between meals. INGREDIENTS: branched chain amino acids (L-leucine; L-valine; L-isoleucine) (60,0%); maltodextrins; beta-alanine; citruline malate; acidity regulators – citric acid, maltic acid; aromas; thickeners – cellulose gum, xanthan gum; sweetener – sucralose; colour for the tropic-orange and mango-oragne flavours – beta-carotene; – beta-carotene; colour for the forest fruits flavour – azorubine.